Quick update on Daejan (DJAN). Summary: I have no complaints about these figures. Rental income and operating profit advanced significantly to new all-time highs, while further valuation gains helped the property group’s balance sheet reach a record £91 per share. Debt remains relatively low and I’m trusting DJAN’s veteran management will be able to take full advantage of any ructions in the post-Brexit property market. The shares trade at 53% of net asset value and I continue to hold. The forthcoming 2016 annual report will provide more details on the group’s progress. But for now at least, the figures thankfully spoke for themselves. Total rental and related income advanced 7% to £138m, although adjusted for an £8m one-off rent settlement enjoyed in 2015, the underlying gain was an impressive 14%. 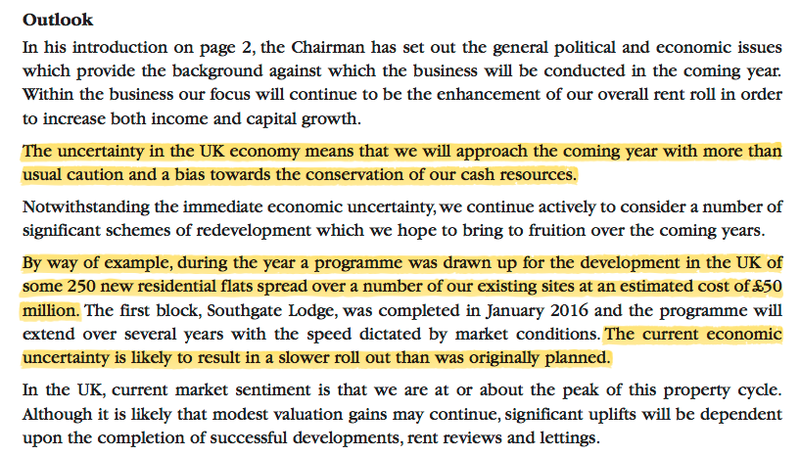 Meanwhile, operating profit before property disposals and valuation gains climbed a splendid 17% to £55m. Valuation gains came to £118m, equivalent to 6.4% of the value of DJAN’s property estate at the start of the year, and pushed the estate’s year-end value to beyond £2bn. The gains helped net asset value (NAV) improve by 10% to almost £91 per share, as well as support a 6% lift to the dividend. A particular highlight from the latest numbers was the operating margin. Operating profit before property disposals and valuation gains represented 40% of total rental and related income — the highest DJAN has recorded since 2003. DJAN’s balance sheet continues to look robust. Capital expenditure for the year was a relatively modest £26m, which allowed net debt to drop by £15m to £237m. In fact, total borrowings of £322m continue to represent about only 16% of DJAN’s £2bn property estate. Furthermore, interest costs of £13m appear well covered by the £55m operating profit. It all suggests the group sports a conservative financial position and ought to enjoy a wide margin of safety should rents and valuations start to wobble. I also trust DJAN’s veteran management will be able to employ greater borrowings if property bargains do appear. “The valuation of the Group’s property portfolio is inherently subjective, depending on many factors, including the individual nature of each property, its location and expected future net rental values, market yields and comparable market transactions. Therefore the valuations are subject to a degree of uncertainty and are made on the basis of assumptions which may not prove to be accurate, particularly in periods of difficult market or economic conditions following the EU Referendum. These results also confirmed DJAN owned net assets with a £221m (£13.56 per share) value in the United States. Currency movements since the March year-end will now make the group’s US portfolio more valuable in Sterling terms, although acquiring new properties in the States will presumably become more expensive with the weaker pound. Trading at £48, the share price is equivalent to 53% of the latest £91 per share NAV. That looks a healthy discount to me. As I mentioned in my original write-up, another way of looking at DJAN’s value is from a return on equity standpoint. 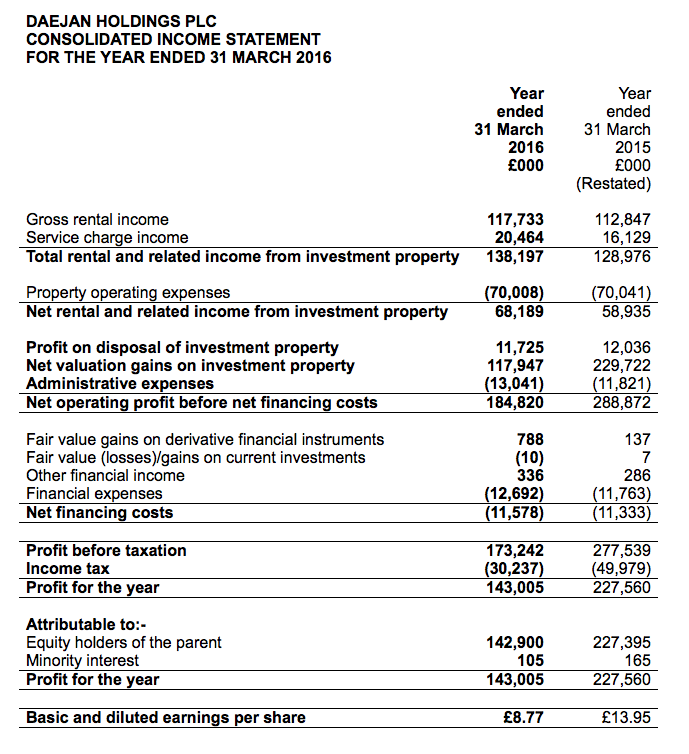 Assuming DJAN can earn an average of 8% a year from its latest £91 per share asset base, typical annual earnings would be £7.27 per share — represented by a mix of rental profit and valuation gains. In theory at least, enjoying £7.27 per share a year from a £48 share price is equivalent to a generous 15% annual return. This entry was posted in Daejan, My Shares and tagged Daejan, DJAN on July 6, 2016 by Maynard Paton. The terse narrative within the original results RNS means there are a few points to note here. 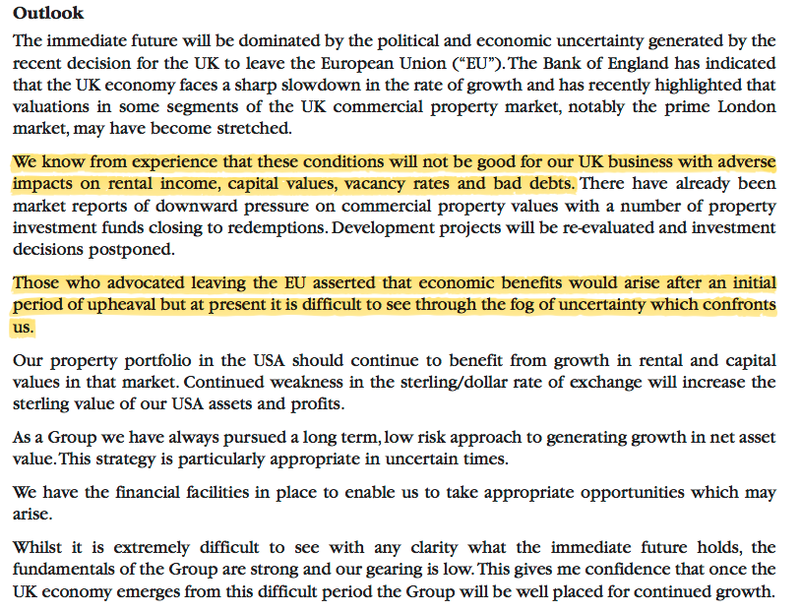 “…will not be good for our UK business” does not sound great. Overall, I must admit this 2016 report did not reveal as much as past reports have in terms of building developments in progress. Chairman Benzion Freshwater has seen his basic pay advance 8.3%pa in the last five years and 7.1%pa in the last ten. In contrast, the dividend is up about 4% pa during the last five and ten years, while NAV is up 10.9%pa in the last five and 7.9%pa in the last ten. So I think the wage hikes have been generally justified, though a £1.1m basic salary does look very hefty regardless of the size of the business. Still, I can’t argue with management’s track record and if £1m-plus salaries are required to keep the record going, then that’s something shareholders have to live with. 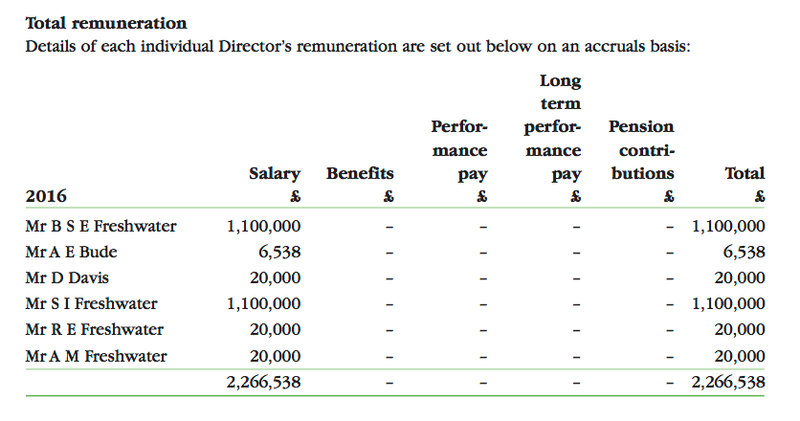 Note that the board does not collect bonuses and does not enjoy pension contributions. Nor is there any option scheme. If tenants pay quarterly then perhaps having 26% of rent etc unpaid is normal. But previous years have seen that proportion almost always below 20%, which is why I am noting this year’s movement. At least the majority of unpaid debtors are not past due. The group paid interest of £13m during 2016, which on average debt of £313m = a 4.1% interest rate. The cost for 2014 and 2015 were 3.8% and 3.9% respectively. 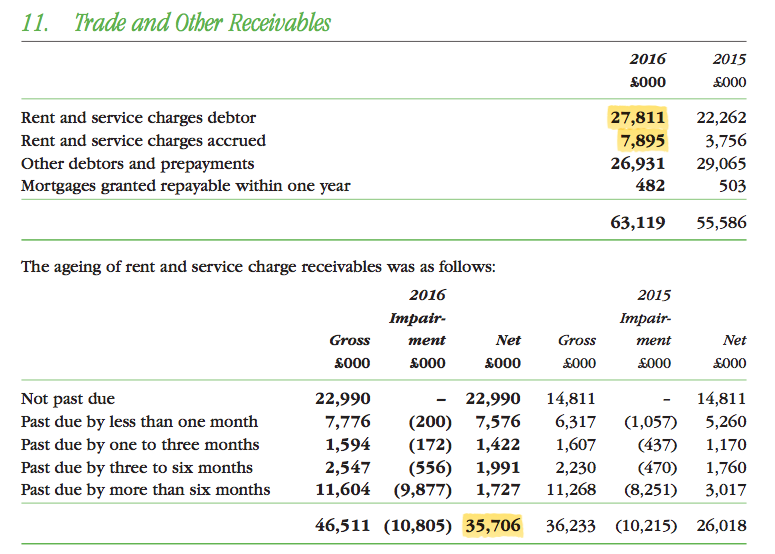 The small increase comes from DJAN taking on more fixed-rate than floating debt, the latter I presume (the report does not confirm) carries a lower rate of interest at present. DJAN reported US net assets (i.e. property less loans etc) of £180m and said the year-end GBP:USD rate was 1.44. GBP now buys 1.31 USD, which I reckon means the £180m net US assets are now worth £180m * 1.44 / 1.31 = £198m. So an extra £18m, which divided by 16.3m shares = £1.22/share. can I ask which do you favor between Mountview and Daejan and can I challenge you on why hold both? The only action I took post Brexit was to hastily sell MTVW which now I regret! Well, if forced to hold only one I would probably plump for Mountview as it is a pure residential property business. Daejan’s commercial property portfolio includes secondary retail assets, which may not produce the greatest sector returns in the future. I hold both as they both offer time-tested management with owner-orientated attitudes, conservative financing, illustrious track records and what I believe to be modest valuations.